There is an A4-sized photo amongst my collection, notable only because there are very few photos I have blown up to that size. The photo is almost surreal. In it, two people stand on the porch of a Classical building. A sign in the background gives the location away – the Art Gallery of New South Wales. The person in the foreground is dressed as something out of a fantasy novel, quilled headdress sweeping several feet into the air, the rest of the outfit equally futuristic, or perhaps something from the past, a couture of leather and giant jewels. In his hand is a whip with a silver skull adorning its handle. The figure in the background could be a God, or a sprite about to cause mischief, a glittering figure with gold face and shining blue hair. The photographer has caught the two figures just as a breeze has blown, and has caught the movement of an arm and hand behind the fantasy figure, and the sweep of the voluminous robe being worn by the God/sprite. The movement, captured on film, gives the impression of bodies just arriving from somewhere? Nowhere? Anywhere? The photo is suffused with a golden light. The subject matter is illusive. 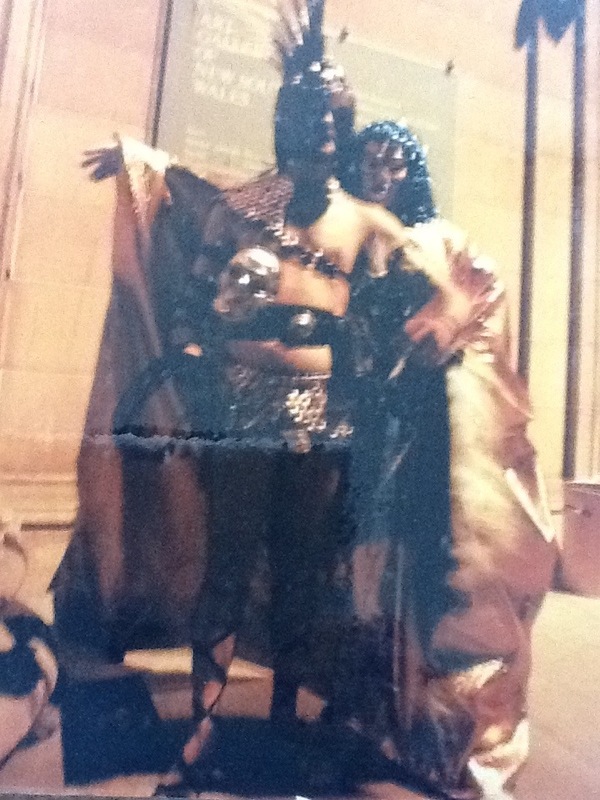 It is Mardi Gras 1988, and the figures are waiting expectantly, nervously, for the parade to start. What can’t be seen in the photograph is a gold lurex bag with a drawstring, clutched in the hidden hand of the God/sprite. They descend the stairs and join the line heading towards College Street. As the parade starts to snake its way down College Street, then into Oxford Street, colourful floats, flashing lights and booming music, surround them. Drag queens cross their paths, as do other costumed visages. Religious fanatics, huddled almost in fear on the sidewalk, hold placards promising Christ’s mercy and forgiveness. These two fantasy figures start to walk alone. The forgiveness of Christ means nothing to them. As they arrive at Oxford Street, the roar of the crowd increases. The figure in flowing gold glances across at his leather-clad partner, and a brief nod of heads indicates to the God/sprite that he is to reach into the bag. As they round the corner into Oxford Street, the God/sprite pulls his hand out of the bag, and flings something into the air. The clamour from the crowd is deafening. A soft cloud of glitter and dust floats down towards the ground, some floating off amongst the crowd, some a soft coating landing on the feet of the fantasy one. A close-up shot of the pair would have shown tears streaming down their cheeks. The God/sprites hand returns to the bag. Don had died on the 2nd February 1988. It had taxed our faith in human nature when his flatmate stole all the furnishings out of the apartment before most of us had even been notified of his passing, but had amazed us with his almost surreal, funeral. Unlike just about every other funeral at that time, Don had not died from AIDS. Instead, we all had to watch his slow, painful demise from stomach cancer, caught too late to be cured, and a secret that Don kept until it was no longer possible to hide it. Some expressed the view that it was nice to know that people died of things other than HIV, and though most of us would not have voiced it, we agreed! We knew of no family. Darby and I had no money, and relied on the generosity of friends on the evening after his death to get the several thousand dollars together to cremate him. He had been well loved, and we had to call an end to their generosity. We had far more cash than we needed. The funeral home managed to come up with two sisters, who had not had contact with their brother for many years. At the Northern Suburbs crematorium, Darby is the MC. I have made up the tape for the service, and tell him where the numbers start. He miscalculates, and Shirley Bassey singing “Don’t Cry Out Loud” fills the chapel. There is a shriek from the front of the chapel, and the sister who had been speaking to me earlier is on her feet and heading towards the coffin, yelling ‘This is one of my favourite tracks too!’. It is only later that Darby tells me that it was not the track he intended to put on. We exchange a look! I left the Mardi Gras party about 9 am the next morning. As I walked down Oxford Street, the street cleaners were working there way up the parade route. “My God, poor Don’s ended up in a street sweeper”, I thought to myself as they trundled past me. Well, he had always claimed that he trashed himself! Perhaps it had all been more appropriate than we ever realised. I smiled to myself as I continued down the street, and the sweepers headed up Flinders Street, towards the show ground.